Three members of our group participated in ELF 10 (12-15 June 2017, Helsinki). Abstract. Research centres and research groups use their webpages for self-presentation and for the dissemination and publicising of scientific activity and results. 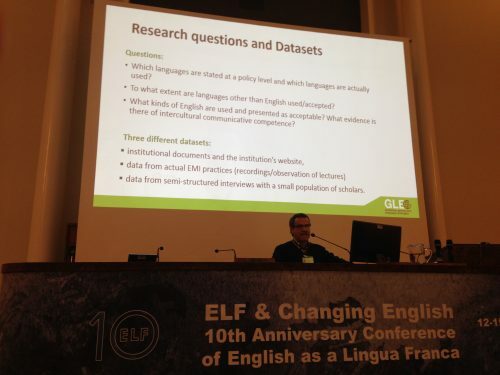 Since English is the lingua franca of scholarly communication, the webpages of some research centres and research groups in non-English speaking countries are written in English, or combining English and the local language, in order to make them more visible at an international level. In this paper I will explore the choice of language (English/ Spanish) on the webpages of research centres, research groups and individual researchers in a Spanish university. I will address the following questions: (i) Are these webpages predominantly written in English or Spanish? ; (ii) Does discipline influence the choice of language in these webpages? ; (iii) When both English and the L1 are used, how do these languages co-exist and interact (e.g. both Spanish and English versions are available, some contents are written in English and others in Spanish); (iv) Why, and for which contents, is English or the L1 chosen? ; (v) which English is considered as acceptable to be used in these webpages? To answer these questions I will complement the systematic observation of the webpages with short interviews to some of the agents (research institute directors, research group leaders, individual researchers). Abstract. As a result of the thriving process of internationalization that many Spanish Universities are undergoing, there is a recent interest in offering English as medium of instruction courses, English being adopted as the common language of choice for academic activities. In this paper I present the preliminary results of research analyzing the pragmatic strategies used by Higher education lecturers in EMI courses in a Spanish university. The corpus for the study consists in 14 hours of lectures in two different disciplines (Business Administration and Nanoscience). The analysis of the data reveals that most of the pragmatic strategies used to pre-empt potential communicative breakdowns, negotiate, and clarify meaning fall into one of the following groups: (i) use of multilingual resources (e.g. code-switching); (ii) self-repair (iii) reformulation. The results show that participants use these strategies to cope with the heavy investment in the communication process that is required when using a vehicular language different from one’s own in such high-stakes institutional academic settings.